EE has made a tablet specifically for kids to make sure your little nippers don't run around and break your precious iPad. The EE Robin looks a similar shape and design to a Tesco Hudl 2, but includes a rubber bumper around the sides to protect it from drops and throws. It's not clear if you can take the bumper off for when it doesn't need protecting though. There's a 7-inch display on the front and a 2MP camera on the back but there's no front-facing camera here. As for specs it's looking to be at the lowest end of the spectrum with a unnamed quad-core processor, 1GB of RAM, 8GB of internal memory, 32GB microSD support and Android 5.1. 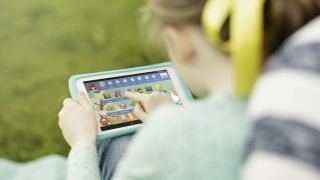 The EE Robin is designed for kids and parents a like, but has a much bigger focus on the little ones coming with 40 pre-loaded games, apps and eBooks such as Fruit Ninja and Berry Rush. It also comes with three-months free access to app Hopster that offers streaming for a variety of kids shows including Thomas & Friends and Postman Pat. After the trial is over it only costs £3.99 per month to keep your kids quiet. You can buy the EE Robin from selected stores on October 23 with a nationwide and online release on November 2. SIM-free it costs £129.99 or you can get it on a pay monthly contract starting at £13 a month.